Customers don’t just magically appear on your doorstep ready to make a purchase. The “buyer journey” is the process that leads them to you, and you have the opportunity to be there for potential customers along every step of this adventure. Marketers often talk about how it’s typical for the buyer to have already made it anywhere from 70 to 90 percent of the way through their expedition before reaching out to a particular company. But rather than leaving you out of the process up to this point, this fact presents a golden opportunity. With the right approach, you can provide support for potential customers from the very beginning. Producing content that benefits customers regardless of the stage they’re in will allow your company to become a valuable resource, helping you to create trust, establish your expertise, and build brand and product awareness. When it’s time to make a purchase, you will already be in the forefront of the buyer’s mind because you’ve secured a place in the front seat for the whole ride. How do you know what the route is going to be? When they first recognize that they have a problem to solve, 72 percent of buyers turn to Google to find answers. Ranking highly in the search results is essential for capturing their attention as early as possible in the journey. 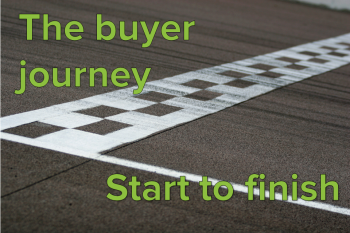 Now that you’ve got the framework of the buyer journey, it’s time to build out the specifics. As you fill in the blanks and create a clearer picture of what your buyers need, it will become easier to see what you must do to be a part of the process. 1. Lay out the path from the first step to the purchase. Why would a buyer need your product/service? When they’re ready to buy? How can you provide the best answers? What channels should you promote the content through? 2. Determine the most likely needs of the buyer at each stage. Before you can start providing the answers, you have to know what the questions are. You might be able to speculate on what these might be, but it’s better to find out what people are actually asking. Talk to salespeople and customer-service reps within your company. They will know customers’ common questions and pain points. They might be able to provide workable solutions. Survey your customers (current and potential) about their needs. Current customers can tell you what they looked for during their search. Potential buyers will reveal what information they are actively seeking. 3. Develop a content marketing strategy for each stage. The content you produce will vary depending on the buyer stage you’re targeting. Set up clear guidelines for each stage to keep everything on track. Consider which content types will work best for the reader’s needs along the journey. Where will buyers be looking and what will they want to find at each stage? Blogs may not be the only option. One of Brafton’s clients saw a big boost in lead generation through an FAQ page. Lay out keyword strategies that will be effective for your product and what buyers are searching for. As the buyer moves through the sales funnel, what they seek out will become more detailed. Long tail keywords allow you to rank higher for more specific searches, so you’ll be one of the first resources they find. Rand Fishkin pointed out that long tail keywords account for the vast majority of searches – more than 80 percent. 4. Create content that fulfills the needs of the customer. Now that you know what your target customers will be searching for, it’s time to start production. You’ll want to disperse your efforts evenly along the funnel to assist the buyer from start to finish. Informative articles will serve the research crowd. *Avoid getting too promotional, as the goal is to provide information and guide the buyer to the purchase, not force your product on them. 5. Promote content across the right channels. The fact that you’ve already targeted the content will help the right people find it, but posting it on social channels and sending out email campaigns can compound your efforts. Mapping out the buyer journey will give you the keys to create more successful content. You can follow the five steps outlined above for each of the products or services you offer to develop a thorough content marketing strategy that covers all the bases. In addition to mapping the route the buyer takes to reach the purchasing stage for a particular product or service it’s imperative to know who that person is. Creating buyer personas is the best way to uncover this information, as using personas will make your content two to five times more effective. When you know who your market is made up of, the questions they ask will change. Be sure you’re providing the answers for the questions each persona is asking.